After 25 years’s you can still count on the same great music, raffles, awards and there will be plenty of sponsors and food choices, all within walking distance of our long established Cruise Location ! 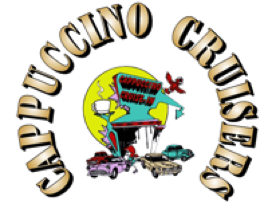 The Cappuccino Cruisers Classic Car Club/Cruise-in was established in 1995, and does not include any membership dues nor are there any club officers. Instead there are just a lot of friendly people willing to help out when the need arises. We are a very community oriented group, regularly participating in the Orangevale Pow Wow Days, Citrus Heights Red White & Blue and Folsom Veterans Day Parades. We have been called upon to celebrate grand openings, bridge dedications, Folsom Dam's anniversary, along with many other community events. We are a proud sponsor of the Folsom Zoo, the Folsom Mounted Patrol and regularly donate to local charities like; Mercy Hospital of Folsom, the Twin Lakes Food Bank, Sunrise Park District's "Hearts for Parks" scholarship program and more. If you have a business and would like to be a sponsor for 2019 please contact us. With the 2018 season over, we would like to thank our sponsors for their support. Click here for a recap of our 1995-2018 Donations. Car Cruisers and General Public Welcome !